Leesburg Volunteer Fire Company is always looking for energetic and motivated volunteers to join our team! We are one of the busiest stations in the county, responding to nearly 5,000 fire and emergency medical related calls annually. Dispatches range from relatively minor emergencies such as fire alarms or slips and falls to large scale incidents like cardiac arrests, auto accidents, hazardous material releases, structure fires and train derailments (metro coming). Numerous other tangible benefits PLUS a sense of accomplishment, community, family, and camaraderie. 12 hours a week minimum running calls. 6P-6A. 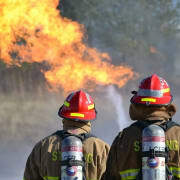 Initial Firefighter training requires two evenings a week and one weekend day.